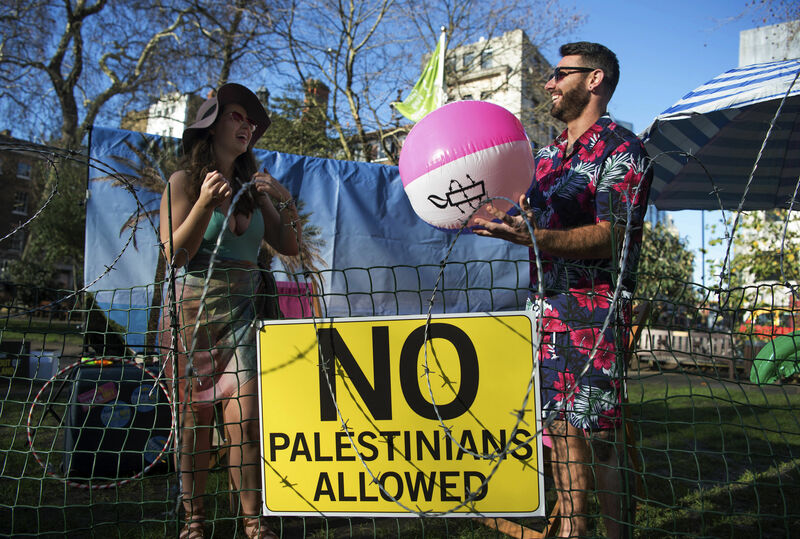 Protesters have set up a “barbed wire beach” to demonstrate against travel companies who arrange holidays in Israeli settlements. 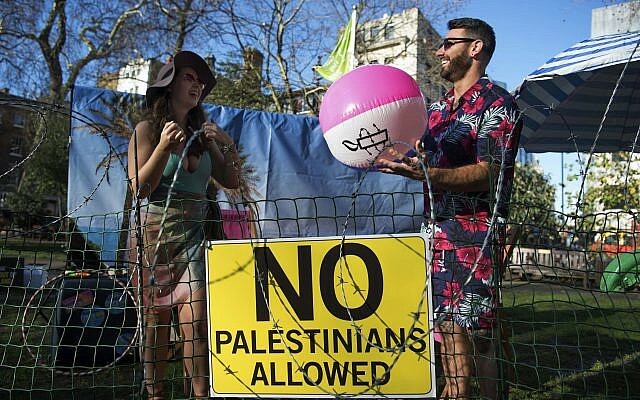 The Amnesty International stunt lasted around 15 minutes and saw models on a mock beach surrounded by barbed wire and “No Palestinians allowed” signs outside the headquarters of TripAdvisor in Soho Square, central London. The models were wearing summer clothes and playing with inflatable balls, water pistols and a giant unicorn float. The Board of Deputies of British Jews and Jewish Leadership Council issued a joint statement, saying the rights group “has a long record of double standards on Israel”, after its report was published this week. 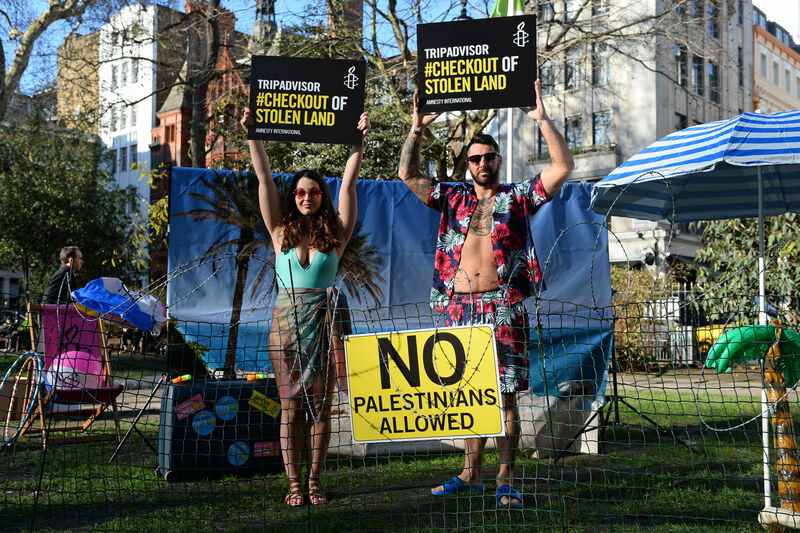 Amnesty International’s UK director Kate Allen said: “We’re here to advise TripAdvisor that they need to check out of the illegal Israeli settlements. “They’re selling holidays to people and where they are going is in the occupied Palestinian Territories. A TripAdvisor spokesman said the firm “believes that travellers coming to our site or app should have access to all relevant information available about a destination, including businesses currently open in those locations. “To this end, we aim to provide travellers with an apolitical, accurate and useful picture of all” its listings. In November, fellow travel company Airbnb announced it would withdraw some 200 listings for properties located in Israeli settlements in the West Bank, saying they were “at the core of the disputes between Israelis and Palestinians”. This comes after Amnesty International UK refused to host a Jewish Leadership Council event in January 2018, on the grounds that the human rights group is “campaigning for a ban on Israeli settlement goods’. Paul Charney, Chairman of the Zionist Federation of the UK and Ireland said: “This report once again shows Amnesty International’s lack of neutrality when it comes to Israelis and Palestinians, by whitewashing any culpability the Palestinian leadership and perpetrators of terrorism have with regards to the conflict.”. Claiming they are “jumping on an anti-Israel bandwagon than actually helping the Palestinians”, he said Amnesty “lost their credibility as a humanitarian organisation the moment they decided to become a political body”. The World Jewish Congress said it was disheartened by Amnesty’s report and called on it to shift its focus back to human rights, while Israeli ministers also criticised its findings.